Archbishop of Canterbury Justin Welby has underscored the value of continuing ecumenical dialogue at a “passionate theological level” while at the same time having “a closer relationship of action” that addresses the needs of the world in such areas as poverty and social justice. In different parts of the world, there has been “a new movement of the spirit,” said Welby. He cited a decision by Chemin Neuf, a Jesuit-founded French Catholic community with an ecumenical vocation, to accept his invitation to take up residence in Lambeth Palace. 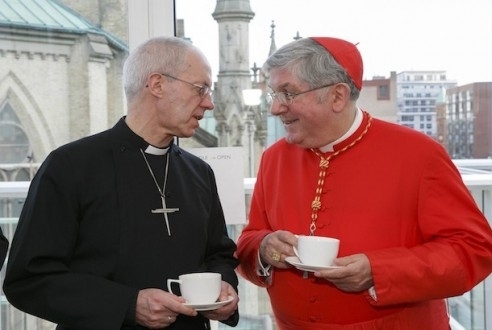 Welby also noted that his relationship with Archbishop of Westminster Vincent Nichols has been “very, very warm,” and that they meet regularly on Sunday afternoons. They recently launched Listen to God: Hear the Poor, a special week of prayer for Christian social action. Before the reception, Welby and the ecumenical guests gathered for vespers at the historic Cathedral Church of St. James. The ecumenical guests included the Roman Catholic Archbishop of Toronto, Cardinal Thomas Collins; Nora Sanders, general secretary of the United Church of Canada; the Rev. Stephen Kendall, principal clerk of the Presbyterian Church in Canada; Lt. Col. Jim Champ, of the Salvation Army, who is also president of the Canadian Council of Churches; and the Rev. Karen Hamilton, general secretary of the Canadian Council of Churches. Also present were Archbishop Colin Johnson, of the Anglican diocese of Toronto and metropolitan of the ecclesiastical province of Ontario; and the Very Rev. Douglas Stoute, dean of Toronto.